WEINHEIM, Germany -- German technology group Freudenberg will decide in the autumn on a potential flotation in 2019 of its automotive vibration control technology business Vibracoustic, CEO Mohsen Sohi said. "We will consider in the autumn whether to launch a stock market flotation [of Vibracoustic] in 2019," Sohi told journalists on Tuesday. The CEO said Freudenberg had up to 3 billion euros ($3.71 billion) on hand to finance acquisitions, even without an initial public offering of Vibracoustic. Earlier this month, Sohi had said the company would make a decision on a Vibracoustic IPO by the end of the year. 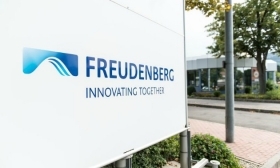 Privately-held Freudenberg in 2016 bought the 50 percent in Vibracoustic it did not yet own from joint-venture partner Trelleborg in a deal valuing the unit at 1.8 billion euros, including debt.